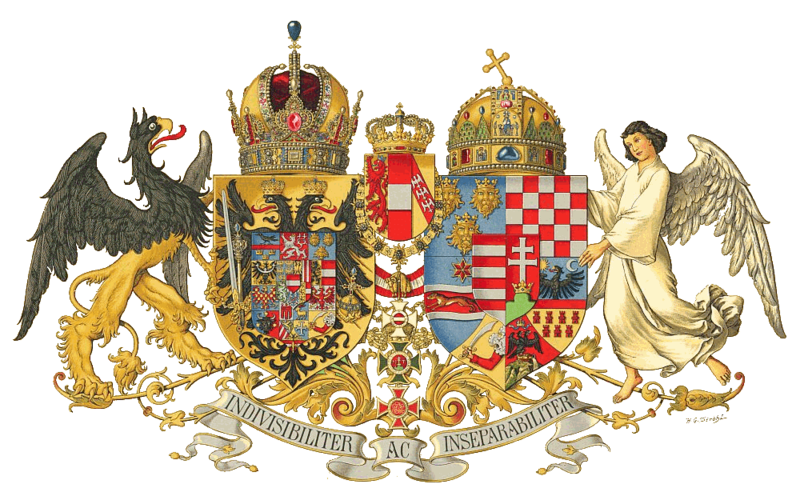 The double monarchy Austria and Hungary was officially created on 8-6-1867 when the Kingdom of Hungary and the Empire of Austria became equal parts within the state. However Austria and Hungary had already been ruled by the same rulers since 1526 when Ferdinand of Habsburg Archduke of Austria and (since 1558) Holy Roman Emperor (1503-1564) succeeded his brother-in-law Lajos II King of Bohemia, Croatia and Hungary. The union ended in 1918 after the defeat of Austria-Hungary in the first World War. The Habsburg Dynasty descends from Radbot Count of the Klettgau (+ 1045) who built the castle Habsburg. His descendant Rudolf Count of Habsburg (1218-1291) was elected King of the Holy Roman Empire in 1273. He defeated his opponent Ottokar King of Bohemia in 1278 and took the duchies of Austria and Styria, which became the core of an ever expanding group of territories that grew predominantly through marriage according to the 15th century slogan "Bella gerant alii, tu felix Austria nube. Nam quae Mars aliis, dat tibi diva Venus", "Others may wage war, but you happy Austria marry. What Mars gives the others, you´ll receive from Venus". Key-marriages took place in 1477 between Maximilian Archduke of Austria and Mary of Burgund, heiress of the Netherlands, in 1496 between their son Philip and Juana Infanta of Spain, daughter of Fernando II King of Aragón and Isabel I Queen of Castille, and in 1521 between their younger son Ferdinand with Anne Princess of Bohemia and Hungary. Ferdinands descendants continued to rule Austria and Hungary, while the descendants of elder brother Karl/Carlos (V/I) ruled Spain and the Netherlands. The elder line went extinct in 1700 with Carlos II King of Spain. Ferdinands line died out in 1740 with Karl VI Holy Roman Emperor and King of Bohemia, Croatia and Hungary. His daughter Maria Theresia succeeded after the so-called Pragmatic Sanction of 1713. She was married to Franz Stefan Duke of Lorraine (1708-1765), who had to relinquish his duchy in the process, but received Tuscany in turn and became Holy Roman Emperor in 1745. The Dukes of Lorraine descend from Adalbert Count of Metz and Chatenois (+ 1033/37), whose grandson Adalbert Count of Metz (+ 1048) was appointed Duke of (Upper) Lorraine in 1047. The first Adalbert probably descends from Adalhard Count of Metz (+ 890). 116. William Pringle Downing * 1812/13 + 1866; Zn van James D.
117. Mary Anne Palmer * … ~ Calcutta 18-1-1822 + voor ..-9-1855; Dr van Charles P.
124. John Neville Warren * Londen ..-5-1818 + aan boord van de Behar op de Rode Zee 21-10-1861; Zn van John Willing W.